The Moon is in Pisces until 6:54 AM, after which the Moon is in Aries. The Moon is void until 6:54 AM (since 6:41 PM yesterday). 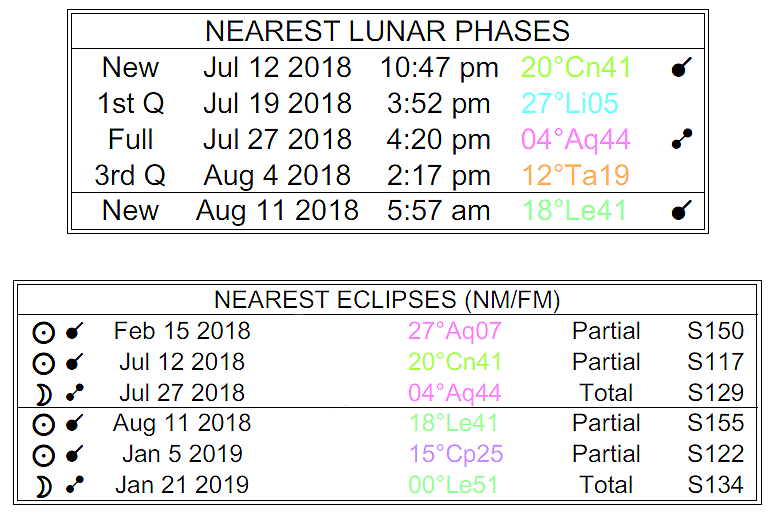 We are in between the Full Moon Lunar Eclipse (which happened on the 27th in the sign of Aquarius) and the Last Quarter Moon (which will happen on August 4th). Mars is retrograde (Mars is retrograde from June 26th to August 27th)—we’re around the middle of the Mars retrograde cycle. Also retrograde: Saturn, Neptune, Pluto, and Chiron. 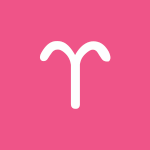 You have no tolerance for restrictions right now, dear Aries, but breaking free from something that’s been holding you back should be done mindfully. Blind reaction to frustrating people or circumstances is unlikely to resolve problems. Your better bet is to identify areas of your life that you’ve been overdoing and put some of your attention into areas of your life that you’ve ignored. In so doing, some balance is restored in your life! For many of you, your social life or happiness goals have been a huge draw, but this has sometimes been at the expense of tending to your practical affairs, which can come to your attention now and disrupt your routine. Interruptions today might lead to a significant new perspective or could introduce new opportunities that will benefit you, so keep your mind, schedule, and options open! The Moon enters your sign today, and you can feel a sudden need to do something new and different. A Mars-Uranus aspect can stir up tension today, dear Taurus, particularly if you’ve been enduring a frustrating situation for which you no longer have patience! If you’re going to rock the boat today, aim to know precisely what you want and what you value since quick reactions may get you into hot water. It’s also essential that you don’t lose sight of those things, situations, and people that/who you value most. While you’re excited about pursuing your goals these days, if you’ve been putting too much pressure on yourself to succeed, it’s probably time for a break that restores and refreshes. While doing your own thing can be good for you, you may want to avoid making a point out of it. Do it for you! The Moon moves into your privacy sector today, drawing you to activities that help wind you down and replenish your energy. Part of you is seeking to push beyond your usual boundaries these days, dear Gemini, but another part of you may be resisting change. The result of this clash can emerge now as Mars forms a square to Uranus. Moodiness may interfere with achieving your goals or spreading your wings, for example. This can be due to inner restlessness or discomfort about a problem that’s reemerging. 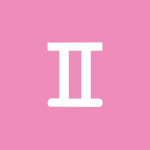 It’s best to avoid impulsive actions and decisions now with more than the usual retrogrades and other influences that can cloud the truth or give you a sense that you need to push something that isn’t ready to move. Consider healthy ways to explore and assert your need for freedom. In other news, the Moon moves into your social sector today, encouraging you to focus on happiness goals after several days of particular attention to the material world or the practical side of your life. 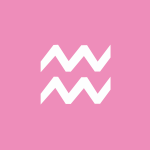 There can be tension, willfulness, and impulsiveness experienced today with the Moon in assertive Aries and Mars in challenging aspect to Uranus, dear Cancer. At the heart of this is some unrest or need for a change, but identifying this can be the hard part. In your relationships, not knowing whether you want to go all in or keep a distance can be an issue for some of you, or there can be frustration if people in your life are see-sawing similarly. You’ve been seeking out more intensity in your experiences these days, but the part of you that needs some emotional detachment and distance can emerge now, possibly in disruptive ways if you’re not entirely aware of the reason for rebellious feelings. Consider ways to preserve your independence in some manner while also exploring deeper feelings or commitment. The Moon moves to the top of your solar chart today, however, and spending some time attending to your career or broader goals makes sense now. If you feel as if others have overruled you recently, dear Leo, and this is possible with Mars in your partnership sector these days, this problem may reach a head now. It can also be a time when someone disagrees with your current goals or approach to your work. Alternatively, career fluctuations or frustrations can disrupt the flow now, and tensions are hard to ignore. Avoid making too-quick decisions now, however. You don’t have all the information you need to draw conclusions. People you’re dealing with can be hard to get close to, understand, or digest. Even so, through conflict or chaos with a partner, competitor, or higher-up, you may discover new approaches that work just as well, or better. As well today, the Moon moves into your sector of spirit and adventure, setting your sights high. This can be a time when all sorts of little things seem to go wrong, dear Virgo, with retrograde Mars in your sector of work and health clashing with Uranus today. These issues may seem to come out of the blue but are more likely a recurring problem that wasn’t quite handled in the past. Tensions regarding limitations related to a health matter or working conditions can reach a head now. As much as you may enjoy pouring extra energy into work or health pursuits these days, you need a chance to explore life more spontaneously from time to time, and upturned schedules can force the issue now. You may want to identify what needs to change and make improvements mindfully instead of resorting to slapdash actions. Mars and Uranus form a square today, dear Libra, and this influence has a way of pushing matters that are in need of a change. As excited you may be about a creative project or exploring a romance or personal interest these days, you need a break from pushing too hard, and circumstances occurring now may force the issue! In fact, you may be limiting yourself by focusing too intensely on one project or train of thought. If you’ve been caged in, even if it’s of your own making, you’ll feel it strongly now, and change becomes necessary. Resisting change can lead to more complicated problems, and so can rebellious actions, so make plans to enforce improvements rather than react too quickly. Also today, the Moon moves into your partnership sector, stimulating your need to seek out company. 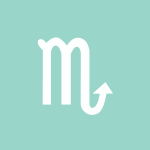 Surprises are in the mix when it comes to close relationships and your domestic world right now, dear Scorpio, with Mars in your sector of home, family, and personal needs clashing with Uranus in your sector of partnerships. This influence reminds you that being flexible has its rewards. It’s possible you experience a clash with family or a partner now, or someone’s show of independence (or unreliability) is abrupt, and you’re put in the position to handle things on your own. Circumstances and feelings experienced today can remind you of the need to release your attachment to a particular method or even a person if it’s excessive. Exercising self-control and focus means you can make a plan for improvement. As well today, the Moon moves into your sector of work and health, stimulating your desire to get organized. With Mars in your solar third house these days, you can be engrossed in your personal interests and projects, dear Sagittarius. If you’ve been ignoring other needs in the process, however, circumstances now may seem to force you to pay attention! 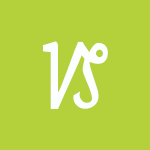 While inventiveness is a positive side to this energy, rashness is unlikely to work for you. If the things that excite you are interfering with order and happiness in other areas of your life, especially concerning daily routines and work, this is a time for restoring the order. Identify areas that require more flexibility. 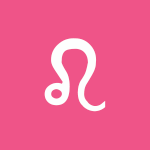 There can be a tendency to rush through communications, traffic, and schedules which should be avoided since the impatience of today’s Mars-Uranus clash can sometimes lead to rash decisions. In other news, the Moon moves into your sector of joy and pleasure today — a generally feel-good transit for a couple of days. 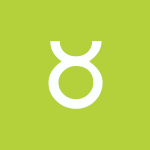 Erratic elements or disorder in your life can be prominent today, dear Capricorn, with retrograde Mars in conflict with Uranus, possibly leading to unpleasant surprises or upturned schedules. With Mars in your solar second house these days, you often want to go your own way, and you can be quite stubborn at times when it comes to sticking with tried-and-true methods! 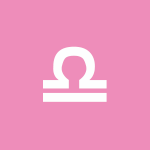 However, Uranus seems to be forcing the issue if you’ve been resisting change or if you haven’t been willing to step outside of your comfort zone. If you’ve been overdoing your focus on one life department, you are likely to feel quite a bit of tension today. Or, this conflict may relate to a clash between you and someone over an issue of respect or values. Keep in mind that much of the restlessness felt now may very well have its root in an inner conflict between a drive for security and an attraction to risk or excitement. The Moon does move into your home and family sector, however, suggesting that it is a good idea to honor your need for security and rest if only for a couple of days. There can be disruptions and distractions to deal with now, dear Aquarius, as retrograde Mars (currently in your sign) clashes with Uranus (your planetary ruler). This aspect tends to force an issue where you or people in your life have been resistant to change. It’s important to open yourself up to the idea of change but to also watch for impatient or rebellious moves. Consider that you may need to take a short breather from your pursuits so that you can restore some sense of order in other life departments. If you’ve been feeling restricted or overruled lately, then you’ll need to release some frustration now — ideally in constructive ways! The solution is not to fight things blindly and loudly, but to seek out ways to assert your needs in a healthy, unforced manner. 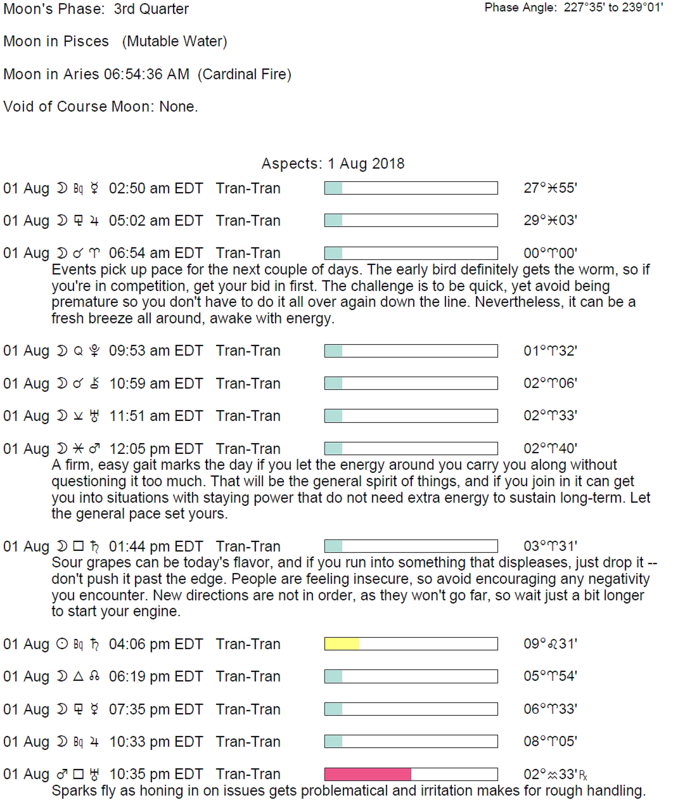 The Moon moves into your communications sector today, and so begins a busier, more connected few days. 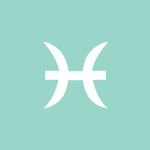 It’s a good idea to avoid pushing something today, dear Pisces, even though energies with us today can leave us feeling impatient or unsettled. 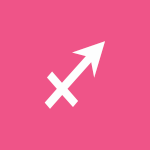 Retrograde Mars in your privacy sector forms a tense aspect with Uranus, suggesting a change is needed. 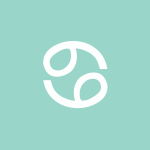 However, planets transiting this sector of your solar chart can be difficult to understand when they’re challenged, and discontent can be tricky to pinpoint. Frustration can be triggered seemingly out of the blue, from a dream, or from a hunch. Your need for time to yourself is pressing these days, but you also have a keen interest in keeping up your communications and connections with others. Consider that putting too much of your energies into one thing can backfire as it disrupts other areas of your life and seek out a better balance. This may very well be at the heart of any tension that arises now. Fortunately, your thinking is especially creative, if not brilliant, today, and solutions to problems can be magical. 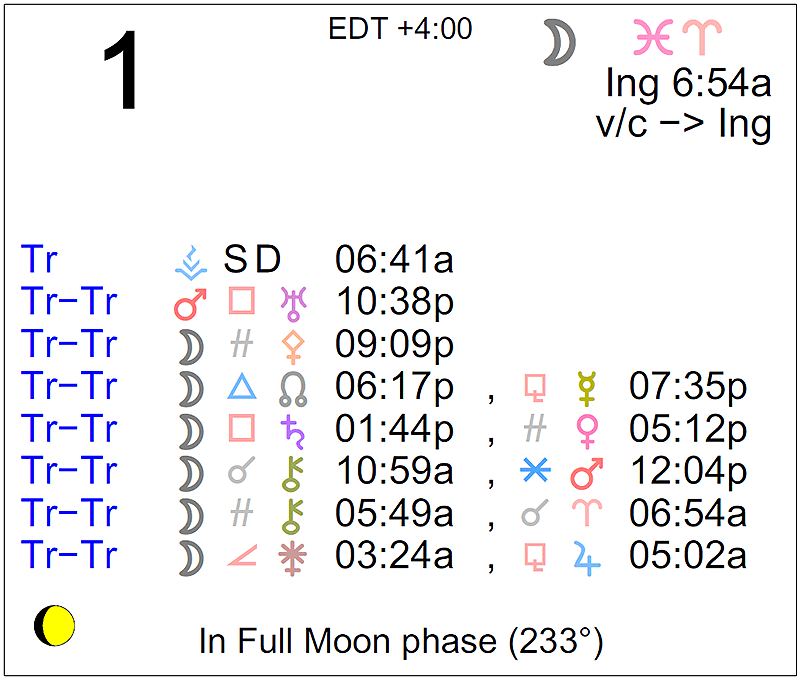 Above are astrological event highlights for the day. Full Horoscopes are at Cafe Astrology. 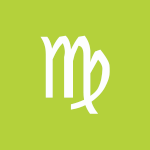 If Your Birthday is August 1st, If Today is Your Birthday full horoscope here. Fire signs are Aries, Leo, and Sagittarius. Fire is enthusiastic, dynamic, and spontaneous, but lacks reflection. We are more courageous and adventurous now, with a tendency to act before thinking. There is little concern about what happened in the past. We are competitive and possibly impatient or bored easily. You tend to suffer emotional pain in your personal relationships. You are so busy caring for your loved ones that you neglect your own needs. This imbalance can lead to you resenting your partners. You also tend to become the peacemaker as you are so sensitive to disharmony. You need to learn to nurture yourself and trust your own wisdom. Sun 03° Taurus 57' 57"
Moon 06° Capricorn 07' 23"
Mercury 09° Aries 38' 56"
Venus 04° Aries 33' 31"